We will be replicating the format used for our $1000 Masters Cups for this event! Qualifiers + Invites > Groups > Playoffs. Our relationship with Matcherino began in September 2016, and has grown from strength to strength since! 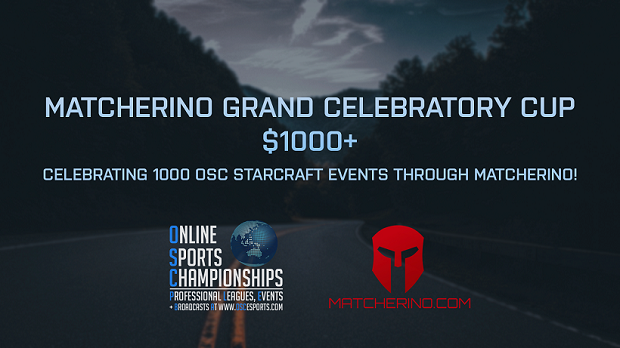 OSC has seen steady annual growth in Starcraft 2 events over that time, while Matcherino has established themselves as the premier platform to facilitate community/viewer interaction, crowdfunding and payouts for events. It’s great to see the OSC and Starcraft community rally around our events, and use Matcherino as the best means to support them. It’s common practice to see !Matcherino in chat channels these days from viewers looking to support, which as an organiser, is fantastic to see. The team at Matcherino are not only super easy to work with, but super hard working, constantly adding updates to the website to improve its functionality and user experience to everyone's benefit. I’d like to thank all involved who made the 1000 Matcherino milestone possible, players, organisers, admins, casters, viewers and of course the OSC + Matcherino teams for making all these past and hopefully many more future cups possible. OSC has been a long time partner of ours, and I'm thrilled that they have had 1000 events on the Matcherino platform. We originally created Matcherino to benefit communities like the StarCraft one and to help groups like OSC grow, but having partners like Eddie, Lazyazylis, and all the other OSC organizers has been our privilege and has, ironically, been instrumental to our own growth. Thanks to Eddie, his team and the fans that helped support all these tournaments... we're looking forward to the next 1000 and showing you what else Matcherino has in store for you." $25+ to winner of each qualifier! Upper Bracket semifinals played for $'s and seeding! Stage 3: 24 Players in group stage. 4 Groups of 6. Bo2 Round Robin SSL style group, with the Top 3 players advancing. Stage 4: R16 Single Elim bracket. By accepting an invite you are expected to show up and playout all group games on the date and time specified. If you’re unable to attend a group stage after accepting the invite, you’re required to give 24 hours notice to allow Tournament Organiser and admins a chance to find a replacement, and let your opponents prepare. If no notice of intent to not play (No show), Tournament Organiser’s can apply for player penalty of 10% of your season OSC Points! If you’re unable to attend on late notice for legitimate reasons, eg sick, a doctor’s certificate/other relevant documentation will be accepted and no point penalty applied. If you qualify for another stage/finals, you are expected to be available for those if play in the group stage. If it’s not possible/practical for a Tournament Organiser to find a replacement from a prior stage, they can apply for player penalty of 10% of your season OSC Points! For other Rules, Regulations, and Recommendations for Servers, Vetos, Race Selection, Walkovers, Streamed Matches + more, see here. Seems like this is a bit overlooked with other events and Blizzcon coming up. First qualifier is in just a few days. Last chance to qualify today!